After Super Greetings across categories, Vodafone has come up with ZooZoo XMas Melodies application on Facebook. 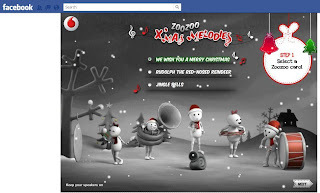 Users have the option to select from a list of three carols sung in inimitable ZooZoo style and add some musical chaos to the selected carol using keyboard keys and recording. Users can then preview the card and share it with friends or post it on their walls. Very Very endearing, well made and topical! Sure to bring Christmas Cheer!